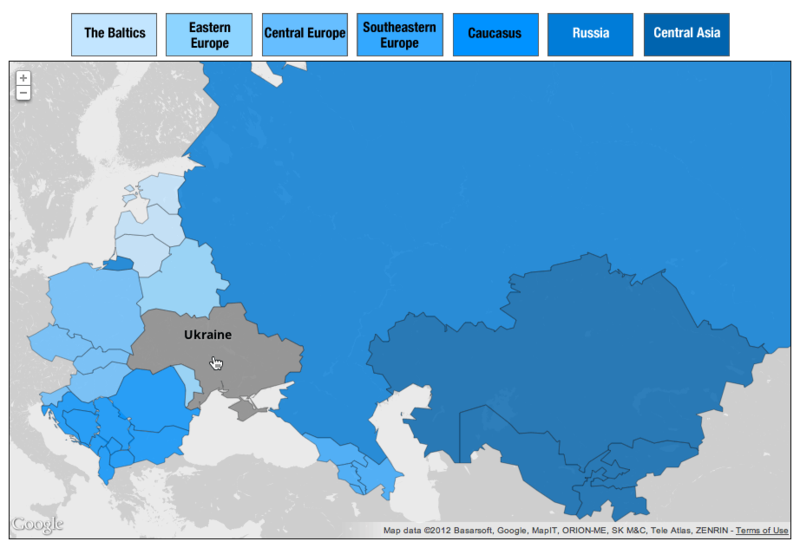 The map uses custom overlays to delineate each country in the region, throughout the seven subregions, each of which will have summary profiles available online. 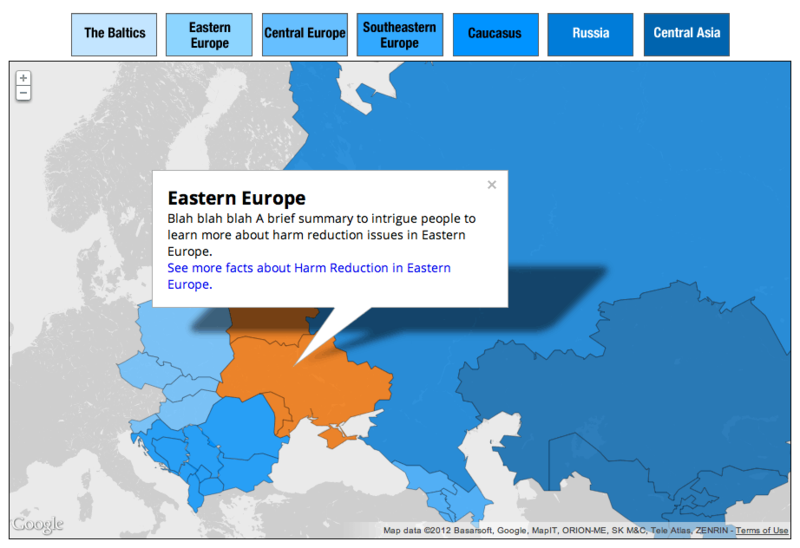 Above, a user hovers the cursor over the country of Ukraine, causing a label to appear and the country’s overlay to change color from blue to gray. Similarly, if a user hovers over a button for one of the subregions of Eurasia, country overlays turn gray for the entire region. 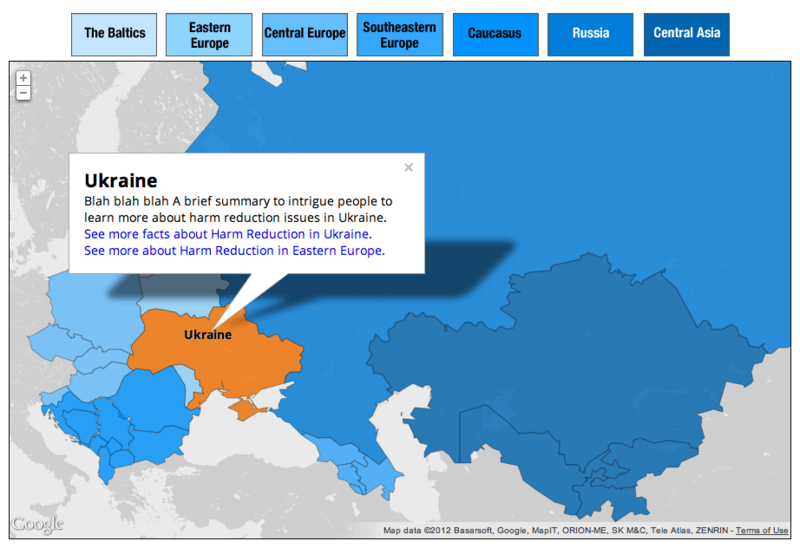 A user clicks on Ukraine to access a Google Maps infoWindow with information about harm reduction in the country. The country becomes orange, and no longer reacts to hover events. If the user clicks anywhere on the map or in the x at the upper right corner of the infoWindow, the window will disappear, and the country will return to its original shade of blue. When a user clicks on one of the subregional buttons, it causes the subregion to be highlighted in orange, and an infoWindow to appear. Like with country infoWindows, the user need click anywhere on the map or in the x in the upper right corner of the window to return the map to its original state. Above, Eastern Europe is highlighted.